Is there a gene that gets activated or some kind of pheromone sensitivity triggered by fatherhood that makes all daydreams turn into contemplations of family-protecting, post-apocalyptic violence? For the second time this year, a horror film has stopped to remind everyone that successfully breeding only hastens your eventual demise. Unlike A Quiet Place, Cargo has more talking. Just like A Quiet Place, Cargo should come with a discount on a vasectomy. A Netflix original written and co-directed by a white person (Yolanda Ramke) who confuses respecting the culture of Australia’s Aboriginal peoples with giving them mystical super powers, Cargo brings a new wrinkle to the zombie genre: Massive eye boogers. Ramke and her co-director, Ben Howling, use a cannibal apocalypse to invert the boilerplate white-savior narrative in a way that is clearly well-intended but hella cringey nonetheless. Yet again, this is a reminder that the easiest way to avoid a film feeling racially exploitative is to actually hire people who belong to the group being examined to help write and direct it. Kudos though to Ramke for truly swinging for the fences by cramming environmental activism, a condemnation of incel-esque toxic masculinity and the oppression of native peoples into a movie where zombies hibernate with butts skyward, their heads in the sand. 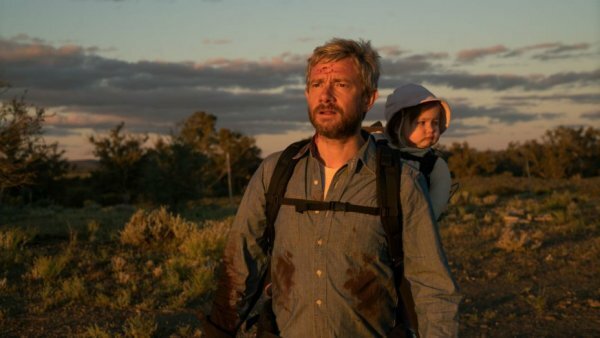 Martin Freeman plays Andy, a dad who has about 48 hours in which to ask a really big favor: He just needs to find someone who will watch his infant daughter for the rest of her life. His quest leads him to a gross monster person (Anthony Hayes) who uses the zombie epidemic the same way some Americans used the election of Donald Trump: as an excuse to let loose the misogyny and racism they had previously barely kept hidden. It also leads Andy to Thoomi (Simone Landers), a delightful character who refuses to stay a mere plot point. Watching Freeman do his level best to bring his unassuming gravitas to a movie with more emphasis on zombie booty than any previous flick is admirable. As he grimly slogs along, willing himself forward while leaning on a walking stick, it’s hard not to hope Bilbo can riddle his way out of cannibalism. Cargo never tries to be outright scary so much as it aims for tense, much like its brother in anti-baby-making advocacy, A Quiet Place. That tension can be clever and captivating, such as an early scene with Andy and his wife trapped in a car as the undead approach or when a tunnel filled with glitching zombies is traversed. The problem is that Cargo isn’t quite complex or considerate enough to work as a moral fable and not quite jarring enough to score hugely on its horror credentials. Genre-bending is always admirable but is also always challenging. Ramke and Howling slightly but importantly miss the mark, only succeeding entirely in once again reminding audiences that reproducing is an eye-boogered hell from which the only escape is madness or death.